Sometimes (actually, really often) I dive into books because I see them repeatedly on “OMG, read this NOW!” or “The next book you won’t be able to put down!” lists and often, they are generally quick and cute and I like spending time with them. I found Beautiful Ruins on the clearance section at my local bookstore here in the Bay Area of California, loved its cover, which was stamped with “Top 100 New Times Book Review,” and it was on many of those charming little Pinterest lists. If you are familiar with those, you’ve probably come across Beautiful Ruins time and time again. The story is split into two major different timelines. The first is set in a remote Italian fishing town in the 60’s, where an American actress is ‘sent’ to a failing but charming Inn, where she forms a relationship with the owner of the hotel. The second, set in current day Hollywood, follows a washed-up producer and his very unhappy assistant on the search for the next success. The story weaves in and out between the two settings, slowly building up to how all the characters are connected. First off, I LOVED the hotel owner—so endearing and just plain cute. I also enjoyed the scenery descriptions, the internal monologue of many of the characters, and the way time moved and made me realize that small actions funnel into larger things later on. Although I felt like there were too many characters (as you’ll read below), Beautiful Ruins was really interesting and done a bit differently than books I’ve read before. It made me pay attention more to the overlapping stories when a new chapter would start especially when I couldn’t quite tell who was speaking. I also liked the subplots of the characters. A big theme in this book was following what is right and not what you always want to do. It made me think a lot about the concept of alternate worlds and how decisions that we didn’t make in this world are playing out in them instead, and I think the characters dive into that a little bit, too. To be honest, I picked up this book thinking it would be a quick summer read that wasn’t challenging or didn’t need me to flip back to previous pages to understand what I just read. Which is fine! 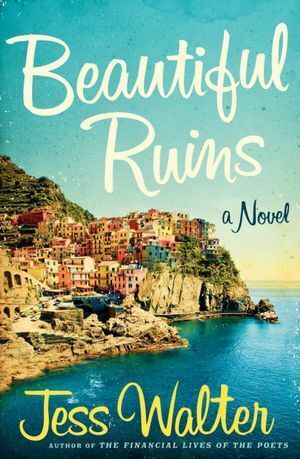 There are many books under that category that I really enjoyed, but I just didn’t get into Beautiful Ruins as much as all the lists told me I would. It was an interesting concept and made reading the book go by quickly, but it felt like a stretch to me in certain parts. Or perhaps I wish the book was longer to really give more insight into each character. The main thing that I struggled with was the number of characters in the story! There were seriously so many major characters with their own POV chapters and dilemmas: the actress, the hotel owner, a guest of the hotel, the producer, the assistant, a guy trying to pitch a story to the producer, and more and more. Another thing is I’ve been reading a lot of books lately that have similar elements as Beautiful Ruins, such as having several characters with different plots, struggling to come together at the end in an ah-ha! moment, and often spanning across several years. This is also probably why I wasn’t overly enthused about it. While It seemed like a wonderful summer read and that I did technically enjoy it, I wasn’t rushing home to finish it or writing about it on postcards.